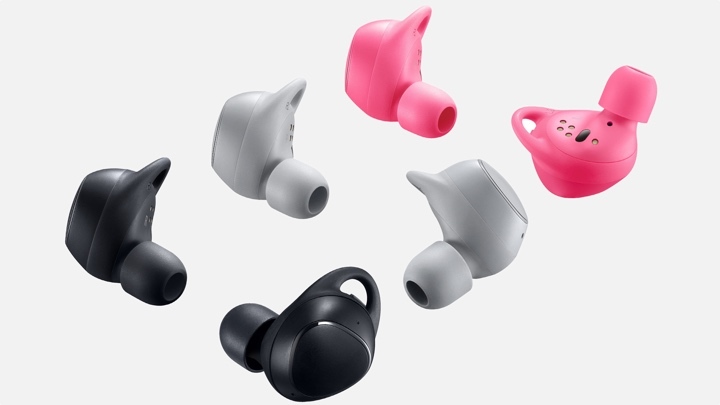 As if the Samsung Gear Sport smartwatch and Gear Fit2 Pro fitness tracker unveilings weren't enough, the Korean tech giant had one more hearable-shaped surprise for us in the form of its next generation Gear Icon X smart earbuds. Like the original sporty Gear IconX buds, the 2018 edition are truly wireless and will still track your fitness. While they might look near identical, Samsung says they are more ergonomic and lightweight this time round weighing just 8g per earbud. They're now also available in black, grey and pink colour models. As far as fitness features are concerned, you still get a heart rate monitor and there's an accelerometer to automatically track runs with a new Running Coach mode that will pipe in updates in real-time to keep you on track. Away from fitness, these buds are also Bixby-friendly so you can tap and hold one earbud to use your voice to control your music. You just need to make sure you have a compatible Samsung smartphone (Note 8, S8 or S8+) to make the Bixby magic happen, though. There's a decent 4GB of storage per earbud letting you store music and leave your phone behind, which is good news. The not-so-good news is that the IconX still only play nice with Android smartphones. Boo Samsung. One of our biggest criticisms of the first version was the poor battery life and thankfully things do get a little bit better here. You can expect to get up to 5 hours in Bluetooth streaming mode and 4 hours in talk time mode. It's still not where we'd like battery life to be, but at least it's going in the right direction. We don't have pricing or release date information for the Gear IconX 2018 edition just yet, but we'll keep you posted.